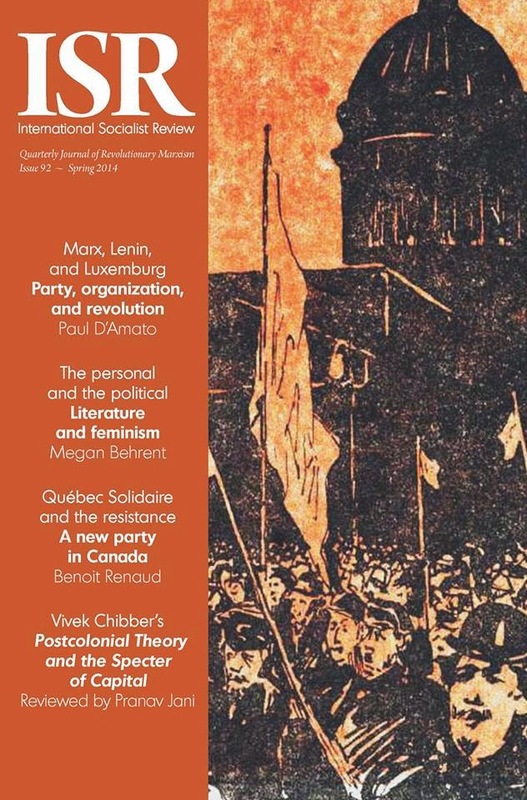 BOSTON SOCIALISM: ISR #92 is on the way! ISR #92 is on the way! Paul D’Amato, "Marx, Lenin, and Luxemburg: Party, organization, and revolution"
Megan Behrent, "The personal and the political: Literature and feminism"
Benoít Renaud, "A new party in Canada"
Samuel Farber, "Reflections on 'prefigurative politics'"
Charlie Post, "The debate on Marxism and history: What’s at stake?" Pranav Jani reviews Vivek Chibber’s "Postcolonial Theory and the Specter of Capital"
Ashley Smith reviews Leo Panitch and Sam Gindin’s "The Making of Global Capitalism"
Ian Angus reviews Max Koch’s "Capitalism and Climate Change" and Daniel Tanuro’s "Green Capitalism"
Sherry Wolf reviews Henry A. Giroux’s "Neoliberalism’s War on Higher Education"